By taking a long exposure, I was able to smoothen the water and capture the moving clouds as well, giving a unique mood to the shot. The boats on the left and below provided a foreground for the shot which added depth and made this one of my best shot from Amsterdam. How can you make a photograph like this? How did I make this shot? Weather – It was a “partly cloudy” evening with some rain earlier in the day. Basically it was one of those days when it is not completely overcast, neither the sky is completely blue. Kind of perfect time to shoot! Timing – I went for a walk around the canals of Amsterdam right after sunset, looking to find a spot where I can capture the clouds, the canals and boats and the architecture of Amsterdam in a single frame. 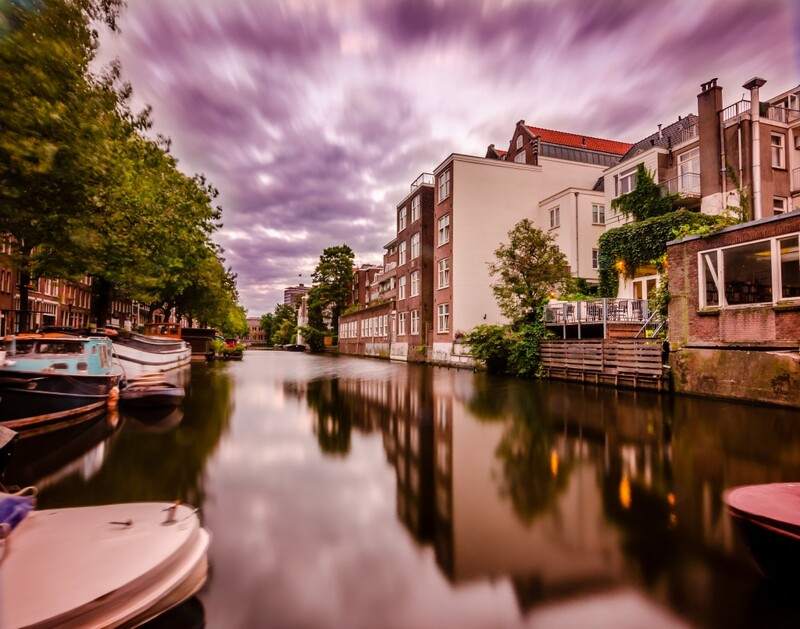 Location – I researched online beforehand what was the best location to photograph, and I choose one street and started my walk near and around the Reguliergracht. Composition – Once I encountered this spot, I put in my wide angle lens (Tokina 11-16mm) as I knew I would need the widest focal length to take it all in. With the lens I moved around for around 10 minutes and found the correct frame I wanted to capture. Gear – Next I opened up my tripod, placed my camera on it and brought out my set of ND filters. I stacked three ND filters which I had in front of the lens to cut back light and get a long exposure to smoothen out waters and capture some cloud movement. Exposure Settings – I put my camera to manual focus as there wasn’t enough light through the lens for auto focussing (due to the ND filters). In manual mode, I played around with many different settings for aperture, shutter speed and ISO until I got this shot at 20 seconds, f8 and ISO 100 to get just the right amount of movement in the clouds. I took this shot in RAW. Must have spent around 20 odd minutes doing so. Once I got back home, transferred the images on to my hard drive and imported them into Lightroom for processing. Did some minor adjustments (pulling down highlights, opening up shadows, adding clarity and contrast, etc) and alas, the image was ready. The pinkish / warmish tint in the image is due to the 3 ND filters stacked in front of the lens. I could have removed this color cast in Lightroom but I let it remain as I kind of liked the dreamy effect it was producing. So that was it. Preparation before the shoot, carrying the right gear for the occasion (tripod, wide angle lens, ND filters), moving around and getting the right composition, patience (walking and waiting for the right light and composition for about 30 to 60 minutes), and around 5 minutes of post processing work was how I made this shot.